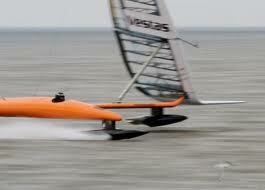 British design breakthrough – fastest ever speed attained in a sailing boat. The video is amazing, as is the story, which reveals interesting differences between the French and British approaches to the problem. Not to mention the Australian approach to announcing the record-breaking nautical mile run (see headline). Who knew there had been a 40 year tussle to get to insanely fast speeds in a sail-powered vessel. 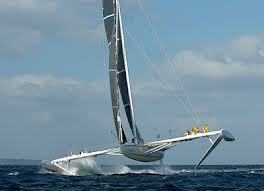 Until recently the record has mostly been held by windsurfers – the power to weight ratio being so good. But recently, the French took a turn. This little clip shows the progress in the race to really astonishing speeds, narrated by the current record holder, Australian Paul Larsen. The French vessel, the superbly-named Hydroptère is awesome. A giant hydrofoil, it seems engineered on the scale of the TGV supertrain, or possibly Concorde. You can gauge it’s size from the the tiny yellow figures of the crew on the right-hand wing. This video shows it in action, traveling at huge speed, and possibly aided by the manic windlass turning of the captain. 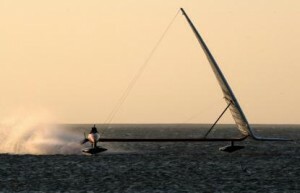 Then enter the British-designed Sailrocket 2, sponsored and built in the Isle of Wight by the Danish wind turbine company, Vestas. This thing looks like a Caterham 7 (tiny lightweight UK sports car with huge performance), compared to the awesome bulk of the Hydroptère. It is of course operated by pieces of string, and the cockpit bears an uncanny resemblance to that of a WWI Sopwith Camel. But golly does it go. This is the money clip, of the thing actually getting to 120kph – and I have to say I wouldn’t want to be in it going that speed. But what an achievement – and a testament to several hundred years of experience of sailing round the Isle of Wight, which has made British boat designers some of the best in the world. And finally, on the design, here is a lovely clip of designer, Malcolm Barnsley, explaining how it works. Classic piece. Note the dartboard behind the door, the almost complete lack of illumination, and the fact that he appears about to back out at any moment from the open doorway in which he is standing . Makes me proud to be British.